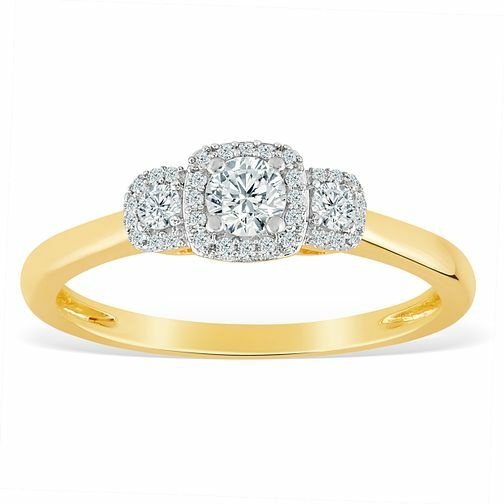 Add elegance and grace to your style with this luxurious three stone halo diamond ring. Styled in luxurious 9 carat yellow gold and adorned with three cushion-shaped halos of diamonds surrounding solitaire stones, totalling 1/4 carat in weight, this gorgeous ring offers a combination of elegance and class while still adding a unique touch to any fashion. This diamond ring is the perfect accessory to bring glam to any look. 9ct Yellow Gold 1/4ct Diamond Three Stone Halo Ring is rated 5.0 out of 5 by 1.